To Provide a foundation from which we can empower other business owners. Helping customers grow by taking the distribution responsibility off of their shoulders. Helping couriers succeed by providing a flow of possible work & sound advise on how to succeed with a transportation business. I know, I know...you wanna know how to pronounce our name & what it really means, right? Well 1st, there is no "H" sound...it's not pronounced "Moho", as many think. It is pronounced just as it looks (in English), so you do pronounce the "J" as MOJO. As for the meaning? We utilize the 3rd definition from the American Heritage Dictionary: "Personal magnetism; charm." Even better is the definition offered by Marshall Goldsmith, author of a book on the subject: "Mojo is that positive spirit toward what we are doing now that starts from the inside and radiates to the outside." So Mojo really relates to doing meaningful work and feeling happy and satisfied. Many people assume the "Mojo" in our name, means; Strong or Powerful...well, it also means that to us! We referred to ourselves as the Mojo Crew, long before we changed our company name to Mojo Courier. It took lots of dedication & commitment to enter into this market, as the "new guy in town", just a few short years ago. We have loved every minute of it! We started business in the fall of 2009 with, 3 old vehicles & big aspirations. Our initial focus was on customer service & building a solid team, but we did manage to grow to 12 drivers by 2014. With our foundation laid, we decided to change our name to one that better fit us. As of January 1st, 2015, we became Mojo Courier LLC, and have since continued to grow. 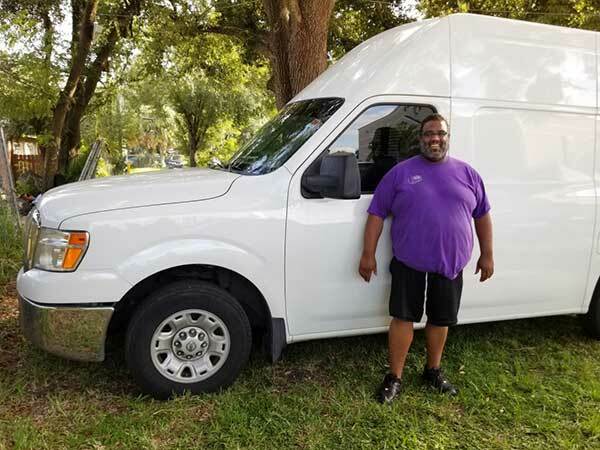 Our founder has brought us a long way from a contract driver, to a fleet contractor, to what we have now become: a full-fledged Courier operation, which operates all over Florida, and beyond. You may notice the Gold ring around the "M" in Mojo...Well, that's a Halo. Are we saying we are perfect? No, just close to it...that's why it is tilted a bit...no one is perfect. But we never stop trying! Think of us as you're A-Team. We get your package to its destination as fast and efficiently as possible, with our close-knit team of drivers. Here at Mojo Courier, we bring together first class service & cutting edge technology to take the load off your mind. You can easily place your order from your computer or mobile phone. You can then track your delivery from pick-up to delivery. We can even set you up with an instant email of each POD as soon as your package arrives at its destination. We have become a very flexible company, serving our customers in a variety of needs/capacities/industries, including: pharmaceuticals, auto and truck parts/tires, office supplies, set-up & assembly, on-demand shipments, and more. We handle anything from a dedicated route, to a quick delivery across town or a hot shot out of state. Our corporate address has always been in Oviedo. Currently our operations office runs out of Casselberry, but we service customers all over Florida, namely: Orlando, Tampa, and Daytona areas. This doesn't mean we aren't in your area though. We have line hauls going all over the state every day and have our South Carolina distributions in Columbia.